Rainman is a great film. The name "Qantas" became synonym in my mind for safe flying from before I had ever got on an airplane. And now part of their plane falls off? Well this is all Qantas needed at the moment. Having followed the company quite closely over the last few months and seen all their problems, it does seem as though they are having a streak of very bad luck. But is it just a question of luck? Apparently the whole drama was caused by a ruptured oxygen bottle that shot into the cabin. The force of the explosion at that height, caused the shrapnel to travel through the storage compartment, the luggage and end up in the business class food preparation area. Fortunately nobody was hurt. But is this just more bad luck or is there a reason behind it? Surely there is some safety check pertaining to those cannisters that would make sure this did not happen. It was not long ago that I covered the strike that Qantas' safety technicians went on, demanding a pay increase. It has only been a few days since the company had to announce that there would be cuts in staff and then there was the whole price fixing situation in late 2007, all to be crowned by ever increasing fuel prices. Is there a danger that these increases in fuel prices are in some way connected to this accident? If staff are unhappy and not doing their jobs properly because the company cannot afford to pay them as much as they would like, are we now in danger? I have not of course lost faith in air travel, it is by far one of the safest ways to travel, but I cannot help but wonder what effects the rise in fuel prices will have in general. 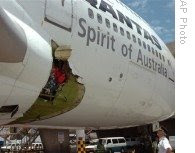 I am sure that this is a one time only accident, the exception that proves the rule that Qantas is very very safe, but there are other smaller companies out there who might have to adjust to higher prices by cutting corners here and there. Can prices affect our safety, and if so, what do we do about it?